New software buyers often feel like a T-Rex trying to clap its hands: frustrated and discouraged. Buying the wrong software can cost construction companies thousands of dollars every year—and these mistakes start with the manager’s approach to buying the software itself. Fear not, future construction management software buyers! I’ve identified the six most common mistakes that all too many have made—and how you can avoid them. 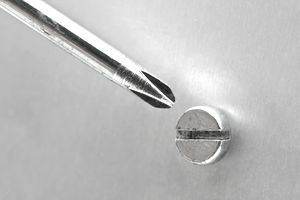 Using software that can be applied to anything is like using a penny when you need a cordless drill to unscrew a screw. The penny is slow; it’ll get the job done, but not necessarily at the speed or efficiency of a tool specific to the job. That’s the difference between something industry-specific and something generic. Take remodeling. According to Remodeling Magazine’s excellent project management graph [PDF], generic software largely can’t keep up with construction-specific technology. For example, while most construction management software offers payroll, subcontractor bid management, and lead management, few generic options do—and many of them require extra work because the add-on must be built by the end user. Make generic software the last option when seeking construction management options for your firm. 2. Buying before identifying all of your firm’s needs. There are so many options when it comes to construction management software. Would you like something in the cloud? Something good for bid management? What about job costing, photo management, and contract management? Do you have subcontractors? Are you primarily residential or commercial? The questions go on and on. Oftentimes, construction management software buyers will just want the most features-heavy software available. But that’s a waste of time for many businesses—most features go unused and the business ends up paying far more than they should for their software. Don’t get drawn to software that appears simple but is not powerful enough for your company. There might be some processes that a construction manager can handle right now, like keeping expenses on Excel. But as your company grows, your software should be able to scale with it. When making the list of your company’s needs, make sure to consider where your company is going next. If you are only focusing on remodeling, will you grow into new builds? Do you want to eventually expand into exterior renovations and design work? Ultimately, choosing software that isn’t flexible enough for your business could lead to reverting back to older technologies which then leave room for user error and confusion. 4. Selecting software that is too complex for you to learn. On the other side of the coin, selecting software that does everything can be a bust because it is simply too complicated or most of the features are useless for your particular business. There’s no reason to overpay for a product you won’t use. To avoid this, make sure to mark on your list of software needs what is a “must” and what is “nice to have.” Make sure to stay within your construction category—there is no need for a residential contractor to look for commercial construction management software, and vice-versa. Would you buy a new car based on looks? Aesthetics—and features—are not everything, especially when it comes to software. Products vary in their fit for different companies—some systems might click better with different personalities and teams than others. Implementing construction software will ease many stressors in your company—if it’s the right product. After narrowing down your company’s needs, test-drive your favorite options. Make sure that as many end users as possible try out the product—not just the software purchaser. That way, if a certain product doesn’t “click” with all members of your team, you can move on without losing any cash. 6. Disregarding the importance of the vendor’s support department. By the time you and your team have narrowed down which product you want to buy, it might feel like the long-haul is over. It’s not. Every product has its quirks, and sometimes you’ll need to call into customer support. Given that construction software affects almost every aspect of your business, it’s important to make sure that help is there when you need it. Make sure to find out about the time zone hours of operation for your vendor’s customer service department. Try giving them a call while in the trial session to gauge their responsiveness and helpfulness. Doing so will ease anxiety about quickly resolving urgent problems should they arise.